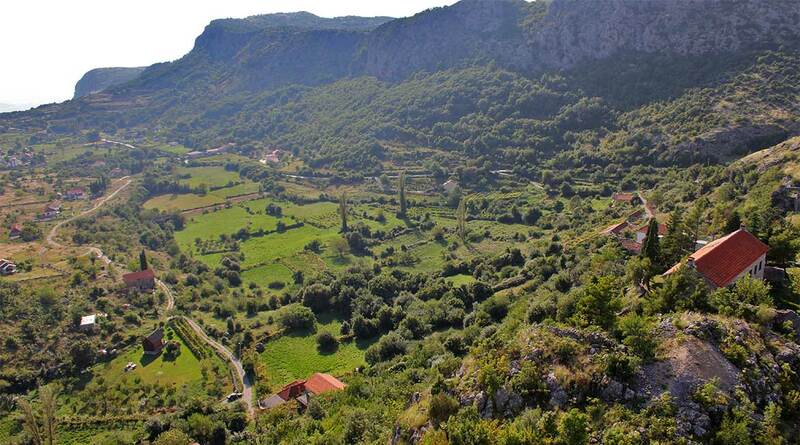 Medun is a settlement located 13 km northeast of the capital Podgorica. The village houses the archaeological site of the ancient fortified city of Medeon, which was used throughout history until the end of the Middle Ages. It is situated in the clan area of the Gornji Kuči, one of the highland clans. In the 2003 census, it had 108 inhabitants. As Mariano Bolizza described in 1614, It is situated on a beautiful hill on a cleft in the mountainside, between two other mountains, overlooking a very spacious valley. Medun was erected originally as a fortress, later on as a town, between 4th and 3rd centuries BC. It was known as Medeon, Meteon, or Modunense. Well preserved walls of the fortress were built of big blocks of trimmed stone, placed in a number of rows. With respect to solidity and size of the construction it substantially differs from the construction of other, less significant Illyrian towns. From the cultural-artistic point of view, two lower dig ups in the rock on the road from the lower to the upper town are very interesting. Studies refer to the conclusion that it was the place of performance of rituals related to the cult of snake that represented myth ancestor to the Illyrians. Necropolis is sited north from the upper town. It originates from the Iron Age, but has not been studied. Medun was mentioned by Titus Livius (59BC-17AD) as a civitas of the Labeates, an Illyrian tribe which lived around the Skadarsko Jezero (Lake Skadar), then known as Lacus Labeatis. Roman legions conquered Medun around 167 BC, during the Third Illyrian War. On that occasion the Ardiaei king Gentius and his family were captivated, marking the establishment of Illyricum. Besides the stairways cut into the cliffs on all sides, dating from the Iron Age, from this earlier period is also a portion of the west wall, subsequently built over by a medieval wall. Different parts of the medieval fortification date from different periods. It was referred to later, in the 7th century, by the Ravenna Geographer. The medieval fortification had been built on the ruins of the Roman city. Đuraš Ilijić (1326–1362) held Upper Zeta, including the city, subordinate to King Stefan Dečanski (r. 1321–1331), and Emperors Dušan the Mighty (r. 1331–1355) and Uroš the Weak (r. 1355-1371). The Balšić noble family which had taken control of Lower Zeta (lands previously held by Lord Žarko), went after Head of Upper Zeta Đuraš Ilijić in 1362, and killed him, expanding further the Zeta župa. The family is recognized as Oblastni gospodari (Lords) in charters of Emperor Uroš the Weak (r. 1355-1371). The 1444 charter of King Alfonse V documents Medun as the property of Stephen Vukčić Kosača. In 1445, Herceg Stjepan ceded the Upper Zeta and the Medun fortress to despot Đurađ. A duke of despot Đurađ defended Medun in 1452 from Stefan I Crnojević who was a duke in the Venetian service. In 1455, despot Đurađ had to give the fortress to the Turks in their victorious drive through Southeastern Europe. During the rule of Ivan I Crnojević (r. 1465-1490), a certain Imrahor Aga took refuge in the region, constantly fighting the Crnojevići and attempted to expel their people from Medun. A bloody battle was fought between the two, in which Imrahor and many other leaders were slain, however, the town is taken by the Ottomans. The battle marked the downfall of the Crnojevići and the loss of a state. The region was organized into the Sanjak of Shkodra, and in 1514, the Zeta region was established into the Sanjak of Montenegro, which would be headed by Stanko Crnojević, the son of Ivan I. Stanko was sent in 1485 to Constantinople as a guarantor of loyalty at the Ottoman court, and he converted to Islam and took the name Skanderbeg, subsequently being put for Sanjak-bey of Montenegro. Mariano Bolizza of Kotor, a servant of the Republic of Venice, wrote a report in 1614, initially for describing Sanjak of Shkodra’s land routes which could best be utilized by local couriers conveying official correspondence from Venice to Constantinople and back, and to survey the military potential of the territory. He also provided a very detailed overview of towns and villages in Montenegro and northern Albania; their respective chiefs and men in arms, as well as demographics. Kuči, Bratonožići and part of Plava were under the soldiers of Medun, the spahee, but the commander was not named; and the highlanders would pay the Ottoman officials a portion of their income. Medun was described as a little town on a hill, strategically situated, but badly guarded and in ruins, of which fortification was held by the Dizdar Aga and 200 “very war-like people”. It was one of 8 cities of the Sanjak of Shkodra. The famous writer, and Kuči tribe leader, Montenegrin duke and hero Marko Miljanov (1833–1901) lived at the foot of walls of the town and the fortress. He was buried in the acropolis in front of the small church dedicated to Archdeacon Stephen, built in Miljanov’s honour the same year of his death. A rebellion in nearby Herzegovina (1875-1878) sparked a series of rebellions and uprisings against the Ottoman forces in Europe. Montenegro and Serbia agreed to declare a war on Turkey on 18 June 1876. Nichola I’s cousin had twice routed the Ottomans at Medun. A Montenegrin victory in Danilograd in Zeta, and the capitulation of Medun, concluded the first year of the Montenegrin–Ottoman War (1876–1878). In 1877/1878, Nicholas I of Montenegro acquired a seaboard on the Adriatic, and on 13 January 1878 Nicholas I and Ahmed Muhtar Pasha signed a truce, ending the war. Medun has not yet been studied sufficiently. Not only that it is interesting for its distant and rich past, it also represents an object significant for studying of all cultural epochs, from prehistory to the Middle Ages.